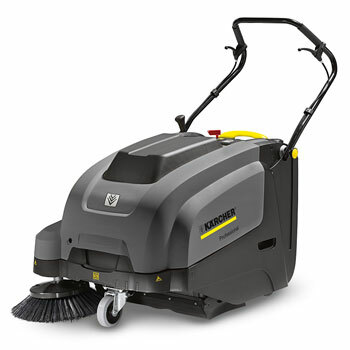 KM 70/20 C Karcher Sweeper - designed for quick indoor or outdoor clean ups, these direct-throw sweepers have a 28 or 38 inch cleaning path, integrated dust filter and an adjustable side broom and roller broom. These walk-behind sweepers also offer a limited slip differential dry system. 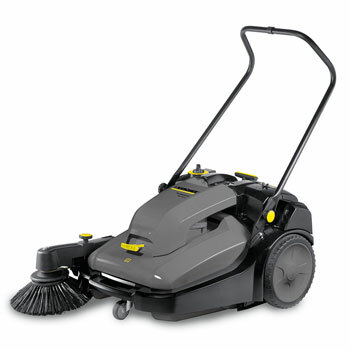 KM 70/30 C Bp Adv Karcher Sweeper - extremely quiet and efficient, this battery-powered sweeper offers a 28 inch cleaning path and 3.5 hours of run time. Compact, it cleans right into corners, and its electronically powered mail roller broom and side broom continuously adjust to surface type – indoors and outdoors. 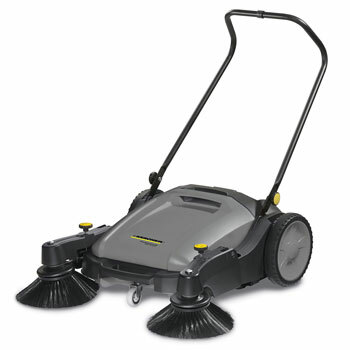 KM 75/40 W Bp Karcher Sweeper - a quiet battery-powered sweeper with a cleaning path of 30 inches and a compact design. This walk-behind sweeper offers traction drive, waste container and an efficient filter cleaning system. Both roller broom and filters can be replaced without the use of tools. 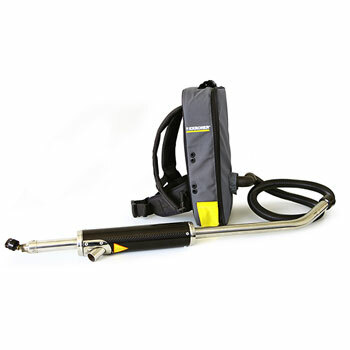 Puzzi 8/1 C Karcher Extractor - a compact spray extraction cleaner offering 1,000 Watts of interim cleaning and at least 1.8 gallon of fresh / dirty water tank capacity. This extractor also boasts up to 96% moisture recovery. 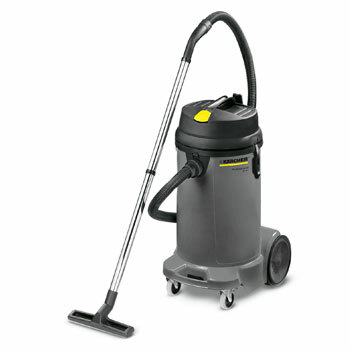 NT 25/1 Ap Karcher Vacuum - provides uninterrupted fine and coarse dust vacuuming with its patented TACT, self-cleaning filter system. This commercial-grade extractor offers 6.6 gallons of container capacity, 24 foot cable and a 1,380 Watt power rating. 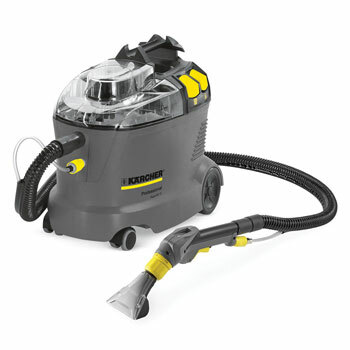 NT 35/1 ECO Karcher Wet/Dry Vacuum - a 9.2 gallon wet / dry vacuum capable of sucking up fine dust, coarse dirt and liquids. It offers TACT, an automatic filter cleaning system, electronic tank level monitor and doesn’t require filters to be installed or removed. 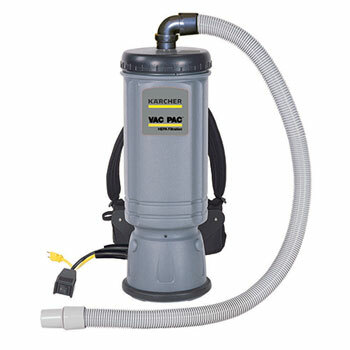 NT 48/1 Karcher Wet/Dry Vacuum - ideal for contract cleaners, this affordable wet / dry vacuum provides a 12.6 gallon container capacity, 80 inches of water lift, 25 foot cable and a maximum power rating of 1,200 Watts. 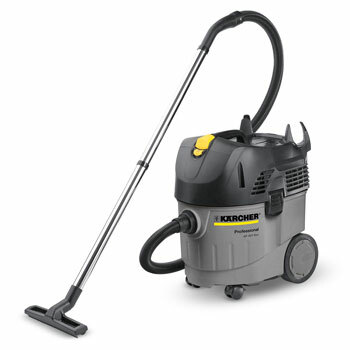 NT 68/1 Karcher Vacuum - with a 24 inch front mounted and self-adjustable squeegee, this 18 gallon vacuum efficiently picks up water. It’s designed to completely empty without tipping it, and it features a crush-proof hose and an ergonomic and durable powder-coated handle. 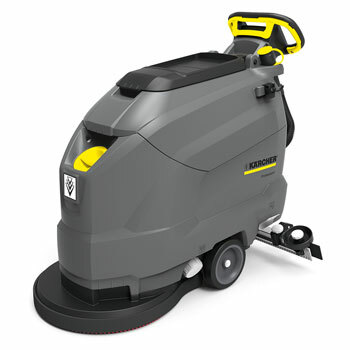 BD 50/50 C Classic Bp Karcher Floor Scrubber - a compact and economic scrubber with an EASY-Operation dial for choosing the appropriate cleaning mode. Perfect for larger applications, this battery-powered scrubber has a working width of 20 inches and an area performance of 13,200 square foot/hour. 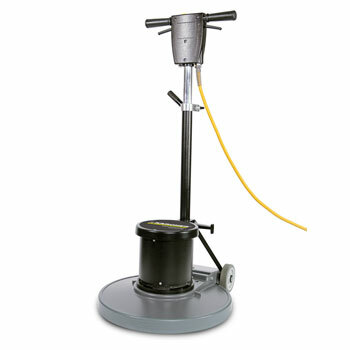 Karcher SG1 C Bp Gum Remover - safely vaporize gum stuck on stone, concrete and even carpet. This battery-powered gum remover uses heat to remove gum in seconds from shopping malls, schools, train stations, airports, supermarkets and more. It comes in a back pack design and offers up to 4 hours of run time. 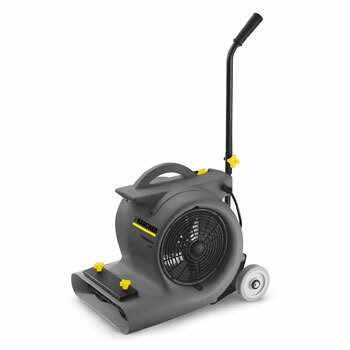 AB 84 CUL Karcher Air blower - cut drying times by up to 50% with this easy to use and powerful air blower. The AB 84 Cul moves up to 3,000 cfm of air, offers three speeds, three standing positions and is the ideal solution for drying spray extracted or shampooed carpets, emergency air removal from buildings and even inflatable play grounds. BV 11/1 HEPA Karcher Vacuum - a light-weight, portable back pack mounted vacuum with four-stage vacuum filtration for excellent air quality. This HEPA vacuum is available in six or ten quart filter bag designs with a 2.5 gallon capacity and a powerful 1.7 hp vacuum motor. It is housed in a molded polyethylene container, weighs only 11 pounds and offers a comfortable, ergonomic harness system. 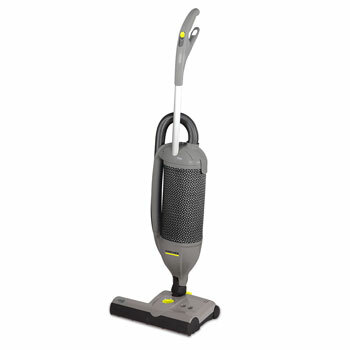 CV 300 Karcher Vacuum - this powerful dual motor upright vacuum not only picks up dirt in a single pass, but it also filters out particulates and allergens down to 0.3 microns with its patented filtration system. This upright vacuum is designed with an innovative, articulating head for easy maneuverability and an ergonomic handle for easy transport. 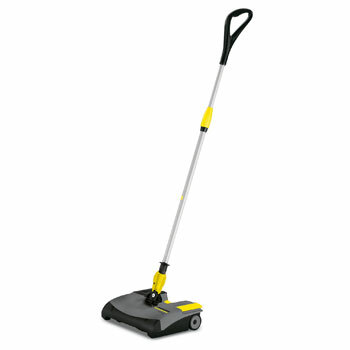 EB 30/1 Karcher Electric Broom - this commercial grade electric broom allows for quick, quiet cleaning and long operation of 30 minutes on carpet and up to 45 minutes on hard surfaces. Its Ni-Cad battery and charger come standard with it, and its ergonomic design makes it easy to use. 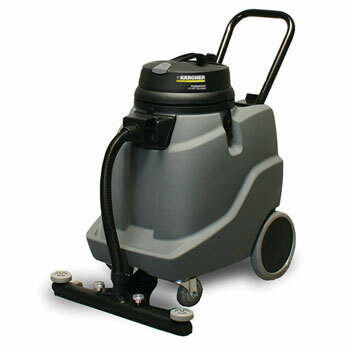 BDS 51/175 C Karcher Burnisher - made of cast aluminum housings and an all-steel triple planetary gear transmission, these commercial-duty floor care machines deliver commercial-grade cleaning - 175 rpms of pad speed and 1.5 hp single speed. The BDS 51/175s are offered in single and dual speed models.